Jackson and Sally's father is in the military. They live on base. He plays with them and coaches their baseball team. One day dad comes in with his bags packed. He is being deployed. An accident happens to their dad while he is deployed and injures his brain. He spends a lot of time in the hospital. The family is so happy when he gets to come home. After a while, they realize their dad has changed. He is short-tempered, distracted and they don't know how to handle it. They meet with a doctor who helps explain to them what has happened to their father. She also gives them some tips for helping them and their dad. 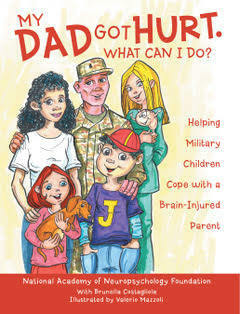 This is a very important book because there are so many families out there who are suffering from this problem. This is highly recommended to any family with children to help them understand what has happened to their parent or another relative. This is a most important book.